The Chinese have used tai chi for millennia. Tai chi for seniors is a great way for the elderly to improve their strength, balance, inner peace and much more. 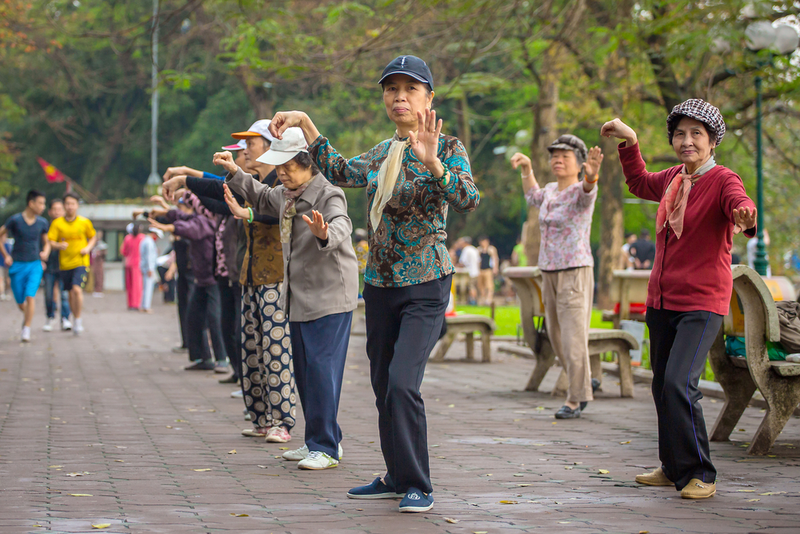 Whether you are a senior or have an aging parent or grandparent in your life, learn everything you need to know about tai chi for seniors in this comprehensive article. Here we discuss the history of tai chi, how it's thought to work, and the benefits to anyone who partakes. How Is Tai Chi Good For Health And Wellness? Tai chi, commonly described as meditation in motion, originates from China as a martial art. It is a slow-moving, low-impact exercise and research suggests it has value in preventing and treating many health problems. Tai chi for seniors can increase confidence and balance. Tai chi is based on ancient Chinese philosophies. Qi is thought to be an energy force which flows through the body. Subscribers to the philosophy believe tai chi unblocks and encourages the flow of Qi. Tai chi is also said to promote the balance of yin and yang, opposing elements which make up the universe and need to be kept in harmony. Remember, you need not subscribe to the originating philosophies to benefit from tai chi for seniors. Do not be overwhelmed or intimidated when beginning tai chi for seniors. The language may seem strange at first, riddled with language such as Yang, Wu, and Cheng. These names honor people who devised specific forms. Some programs emphasize healing and stress reduction while others emphasize martial arts. The name is not important. The important thing is to find a form that works for you, whether that focuses on short, easy movements and focusing on your breathing or is more physically strenuous. Talk to your doctor if you have a medical condition, limiting musculoskeletal problem or take medications with side effects including dizziness or lightheadedness. Tai chi has a great track record of being safe, and you can probably find classes at the local YMCA, senior center, or community education center. Whether you prefer the camaraderie of a group or practicing at home, tai chi is a great exercise for both the mind and body. If you want to learn how to practice tai chi for seniors, it is recommended you take a class. You can learn by watching videos or reading instructions, but a professional instructor can advise you on what you are doing wrong, how to do it correctly and any modifications you can make if you have any physical limitations. Ask your local instructor if you can sit in on a class to see if you feel comfortable with the atmosphere and like the teaching methods. Then, you can learn if the class is right for you without the risk of paying for four or more classes up front and finding out afterwards they are a poor fit for you. There is no standard licensing or training for tai chi instructors so you will need to use your best judgment to find an experienced instructor who will accommodate your current fitness level, coordination skills and unique health concerns. Take your time. If you enjoy the atmosphere of your local class, sign up for a 12-week program. This will include one or two weekly classes and you are encouraged to practice at home. Consistently practicing tai chi comes with a host of benefits. To ensure maximum comfort, wear loose-fitting clothes that will not reduce your range of motion. Most people practice barefoot or in a pair of flexible, lightweight, comfortable shoes. Your shoes should not slip and provide you enough support to help you balance but soles thin enough you can feel the ground. Do not use running shoes, specifically designed to propel you forward and absorb the impact and shock of your running. The thick soles make this very poor for tai chi as you will be unable to feel the ground during your practice. If you would prefer learning from home, go to your local library and take out videos when you are starting out. 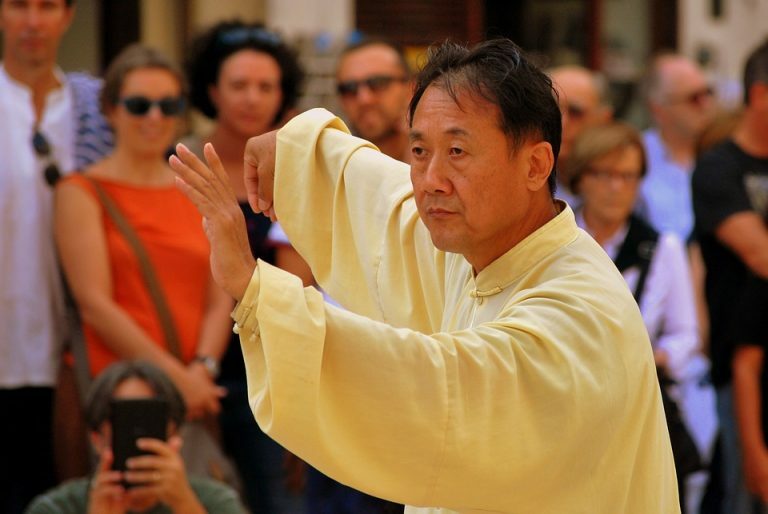 Once you become more familiar with the terminology through seeing the motions in action, tai chi books with pictures and detailed descriptions can be a great resource. Tai chi is fantastic for health and wellness. Programs will teach you a series of graceful, soft movements which help to promote flexibility and circulation, reduce pain and strength and improve your balance and strength. Some classes even include supplement treatments such as massage therapy, focused attention, breathing techniques for relaxation, meditation practices, and acupressure. If you have a limited ability to stand, then you should ask your group leader if she can provide you with a chair so you can still take part in the class. You are welcome no matter your age or fitness level. A tai chi class is usually broken up into parts. You will start with a warm-up. This includes easy motions to help loosen your joints and muscles and focus on your body and breath. Make circles with your shoulders, turn your head from side to side and rock back and forth. Your instructor will teach you tai chi forms, which are a series of movements. Short forms may include as few as a dozen movements while long forms may consist of hundreds of short movements. Tai chi for seniors or less fit individuals usually starts with short forms including slower, smaller movements. Chi Kung (qigong) is translated as "energy work" or "breath work," and it consists of a few minutes of gentle breathing that is sometimes incorporated into forms. This helps to relax the mind and mobilize your energy within your body. You may perform qigong while standing, sitting or lying down. 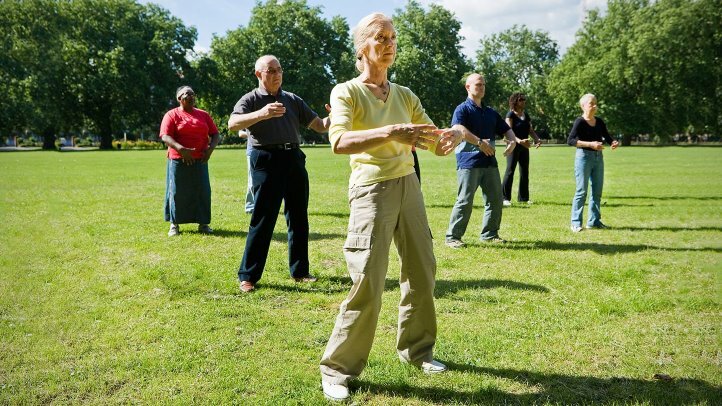 Tai chi for seniors comes with many benefits. Learn and practice elder-friendly tai chi movements to improve balance, reducing the risk of a dangerous fall. With more sure balance comes an increase in confidence. Do not live in fear of a fall that could break your hip, knee or ankle. Live out your life in confidence. Improve your gait and enjoy long walks beneficial for the maintenance of your health. Although tai chi involves low-impact movements, depending on the size and speed of the movements, you may get aerobic conditioning benefits out of it. Depending on the heart rate your physician wants you to get to, you may need to supplement your tai chi workout with more standard aerobic exercises. Tai chi is also a great way to condition your muscles using bodyweight movements. It can improve both upper-body and lower-body strength and is comparable to walking and resistance training when performed regularly. Besides the unsupported arm movements exercising your arms, your lower back and abdomen and the rest of your core is also engaged. Tai chi is a great way to improve upper-body and lower-body flexibility, much like yoga. Tai chi reduces falls by improving balance. Falls are of a great risk to seniors because their proprioception, ability to sense the position of one's body in space, declines as we age. Tai chi helps to train the function of sensory neurons in the inner ear and stretch receptors in the ligaments and muscles, meaning you are much less likely to fall. Even if you stumble, tai chi will help you develop stronger, more flexible muscles, and according to several studies, tai chi reduces the fear of falling in seniors. Tai chi for seniors may look like a slow, graceful dance with intentional, low-impact movements, but it is far more beneficial than it looks on its deceptively simple surface. When practiced regularly, tai chi offers a wealth of health benefits not only for seniors, but men and women of every age. Speak with your general health practitioner before practicing tai chi for seniors if you are concerned about any existing medical conditions. Your doctor will probably recommend you try it out because it's a very safe exercise. Depending on your needs, you may opt for slow, easy movements and breathing sessions you can perform lying down or sitting if you can't stand for long periods of your time. Seek an instructor who will accommodate your individual health needs and concerns. He or she may provide you with a chair so you can sit during part of the class, and while it's recommended you sign up for 12 weeks of tai chi lessons, ask if you can sit in on a class before you commit to paying for months worth of classes upfront. You will gain improved balance, flexibility, cardiovascular and musculoskeletal strength, and reduce the risk of a falling if you regularly practice tai chi. To ensure maximum comfort, stay hydrated, eat well, wear loose-fitting clothing, and wear appropriate shoes. Whether you want to be taught by an instructor or learn at home, you can benefit from consistently practicing tai chi for seniors no matter your age or fitness level.